Snoring and apnoea should be treated, not tolerated. 'Sleep disordered breathing' conditions such as snoring, 'upper airway resistance syndrome' and sleep apnoea are recognised medical conditions with clear links to a wide range of serious side effects and co-morbidities. The good news is, snoring, UARS and apnoea can be treated. 'Best practice' treatment is available via CPAP (constant positive airway pressurisation), OAT (oral appliance therapy) and/or surgery. Through our Regional Sleep Clinic services this level of care is now available all around Queensland, including all cities and regional areas, plus some interstate locations. The Sleep Therapy Clinics are specialised professional practices which are dedicated to the excellent treatment of 'sleep disordered breathing' (SDB) conditions. Helping patients with treatments and therapies for their snoring and sleep apnoea is a central part of our practices' focus, rather than a mere sideline. A diagnostic sleep study (polysomnogram) is performed before and after treatment to determine the nature and severity of the snoring or apnoea, and then to objectively confirm the effectiveness of treatment. These diagnostic sleep studies can be performed in a hospital-based 'attended' setting, or with portable sleep diagnostic recorders which allow patients to complete the study in the comfort and privacy of their own bedroom. An additional diagnostic tool is our acoustic pharyngometer, which uses sonar-like technology to map the patient's airways, as featured recently on Channel 7 News. Only Accredited Sleep Therapy Clinics are equipped to provide a full range of professional non-surgical treatments for sleep disordered breathing conditions, including Constant Positive Airway Pressure (CPAP) therapy and Oral Appliance Therapy (OAT). Where surgical intervention is necessary, referrals to expert ENT surgeons can also be arranged. Where possible, diagnosis and treatment is offered in the comfort and privacy of your own home, rather than in a hospital based sleep lab environment. The Best Snoring or Apnoea Treatment For YOU! This full range of snoring and apnoea treatments means you can be sure of getting the therapy which truly is best for you, as we have no vested interest in one treatment rather than another. Our approach to treatment is endorsed by the Academy of Sleep Medicine and recognised internationally as 'best practice'. Call us today on 1300 246 637 for a free, no obligation chat with a friendly Treatment Coordinator, or use the form below to request further information. Snoring and sleep apnoea are serious conditions which must be treated. Contact us today and experience a different, better future. 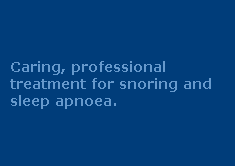 For information on our professional, non-surgical treatments for snoring, sleep apnoea and related sleep disorders. Snoring is not just a nuisance – it can cause serious harm.This section will give you the latest information on why snoring is NOT something you should ignore. Snoring and sleep apnoea can be treated.This section looks at the main surgical and non-surgical options and explains how The Sleep Therapy Clinics can help. Quick responses to frequently asked questions. Includes a comprehensive glossary of relevant medical and dental terms, along with their meanings. For information on the treatments which we can provide, and/or for details on where to find your nearest Sleep Therapy Clinic. Links to scientific studies and reputable web sites where various treatments are assessed and reported on. Click here if you would like to go straight to information on how The Sleep Therapy Clinics' treatment can help you. Providing diagnostic services, CPAP therapy and dental treatments for snoring and sleep apnoea to all of Brisbane and Pine Rivers, with regional sleep clinic services available to patient in Toowoomba, the Sunshine Coast, the Gold Coast and Northern NSW. We regularly treat patients from surrounding suburbs such as Mitchelton, Bunya, Gaythorne, Brisbane, Everton Park, Everton Hills, Albany Creek, Bridgeman Downs, McDowall, Keperra, Warner, Eatons Hill, Arana Hills, Ferny Hills, Ferny Grove, Stafford, Enoggera, Oxford Park, Upper Kedron, Chermside, Ashgrove, Newmarket, Herston, Windsor, the Gap, Grange, Indooroopilly, Bardon, Paddington, Kenmore, Chapel Hill, Sandgate, Strathpine, Cashmere, Bald Hills, Petrie, Murrumba Downs, Lawnton, Bray Park, Whiteside, Joyner, Kallangur, Carseldine, Taigum, Fitzgibbon, Boondall, Brighton, Zillmere, Banyo, Nudgee, Virginia, Bracken Ridge, Samford, Draper, Yugar, Camp Mountain, Dayboro, Kilcoy, Highvale and Wights Mountain. For CPAP or dental treatments for snoring / sleep apnoea, call today. We also deliver Queensland Regional Sleep Clinic services in Mount Isa, Emerald, Biloela, Mitchell, Dysart, Longreach, Weipa, Mackay, Charters Towers, Cloncurry, Goondiwindi and many other regional locations. Call today on 1300 246 637 for more information about how we can help.